i have a big problem, there is some size limits to the boom format that prevent the use of teleporters? i've got a quick search on the internet but i found nothing .-. I'm using a teleporter in my map and its working great. Haven't tested it with Boom though, but I can't imagine that being a problem. map finished! now it need a lot of playtesting... if anyone want to do it, just ask, and i'll post a link here. i'll send it to keeper when i will finish to test it by myself. Also, as you can see, the sky texture looks weird in Zdoom - only the first patch is displayed. Anyone knows what to do? Test in PRBoom+ instead? It's what I'm doing, despite GZDoom being my port of choice. Not entirely sure what -complevel, though. Can't be too hard to figure out. cc4 textures pack is not merged, i'll reupload with it if necessary. Are you sure you're playing the correct level? It's probably on its intended mapslot. tell us exactly what happened, boom does not start? an error occur when you idclev to map 21? missing textures? anything else? thank you, and as ever, welcome to hell. I've finished like 90-95% of map 20, I'm adding another secret just to make sure that it's possible to beat the map and that the map isn't so easy. And I'm working on the ammo&health placement very carefully, especially on the amount of cells. the lack of ammo depends on what skill level you are playing, on easy there is a lack of shotgun shells in certain areas (like the tird room); in medium some monsters will always figth each other, lowering the ammo usage; i have tested the uv only to the 3° room, i had no time to go any further. anyway if there is some serious lack of ammo, i will add some more, if you scavenge a bit you will surely find enough. Joseph Lord: try to grab the cc4 textures pack and run the map with it, if that don't work try to use zdoom (always including the cc4 pack). you can find the cc4 pack at the first page of this tread. cc4-tex.wad is NOT included, so please don't forget to use! PS. :Oh, Cacowad, I forgot to mention something that is very important. I have no idea why, but I feel this music perfect for a winter/frozen level. Katamori: i'll play your map as soon as possible. Oh, and I've finished Scythe2 MAP20 once before on HMP difficulty. Wasn't as hard. Five maps completed, very nice work everyone! I continued working on my map today as well. Second room of "Nabataea" is nearly done. It's the exit room where all keys are used, so I wanted to make it first before I make the key-gathering rooms. No screens yet since it's not entirely finished yet. Expect some before too long, though! EDIT: Also played your map, Katamori, and I really like it! It's got that "short and sweet" taste to it, kind of reminded me of Scythe 1. Very tight gameplay, too. Enough ammo to kill everything yourself if you want to, with opportunity for infighting with the Cyberdemon. Very nice. I think it may be one of my favourite maps yet (err, I hope that doesn't offend anyone). 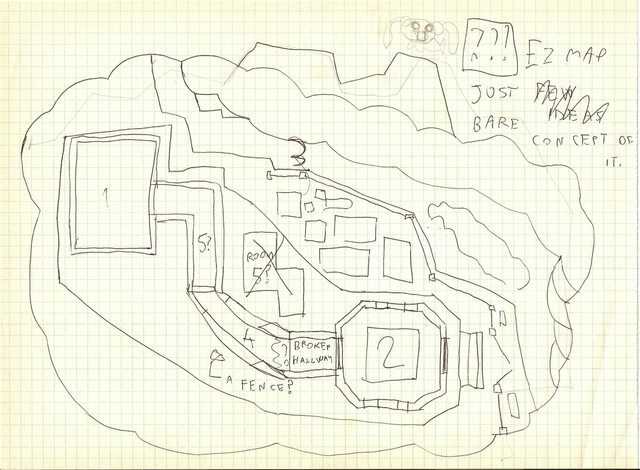 However, actually I get the idea (the buildings high around, to be precise) from the first map of Community Chest 3 - I hope it doesn't look like a copy. When I played the map I even had extra ammo but I sometimes rely on infighting and I provided about 2-3 bfg shots for every cyberdemon. On the revenants&viles second trap I just rush to the Invulnerability secret and then I kill them with rocket launcher from a close range. When the first monster ambush starts I just let them fight the first cyberdemon in order to save ammo.